MOSCOW, November 14. /TASS/. 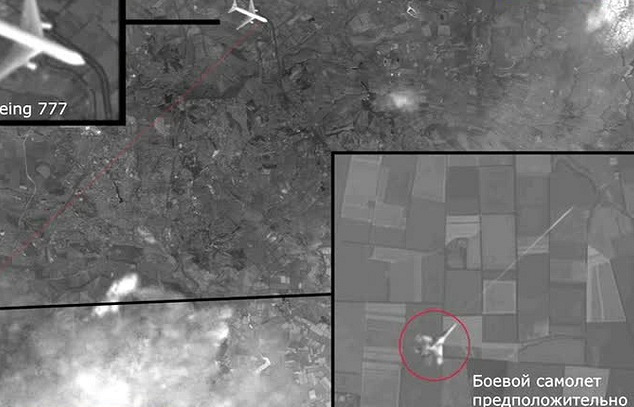 Russia’s television Channel One said on Friday it had a photo presumably made by a foreign spy satellite in the last seconds of Malaysia’s MH17 flight over Ukraine. Channel One showed Ivan Andriyevsky, the first vice president of the Russian Union of Engineers, demonstrating a photo sent by a George Beatle, who had introduced himself as an air traffic controller with a 20-year working record. According to Beatle, the Malaysian Boeing was shot down by a fighter jet that followed it. First, the Boeing came under gun fire and then the cockpit was hit by an air-to-air missile, its right engine and the right wing were hit by a heat-seeking missile. The e-mail had an enclosed snapshot of a missile launch from under the fighter’s left wing directed right at the Boeing cockpit. The Boeing 777-200 of the Malaysia Airlines en route from Amsterdam to Kuala Lumpur crashed on July 17 in Ukraine’s eastern Donetsk Region, some 60 km (over 37 miles) from the Russian border, in the zone of combat operations between the Donetsk self-defense forces and the Ukrainian army. 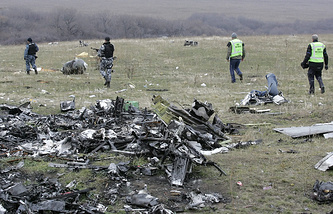 All the passengers and crewmembers onboard the aircraft - 298 people - died. Most of the passengers - 196 people - were Dutch citizens.